Mamma Mia! Here We Go Again is both what you expect it to be and not at all what you might want it to be. 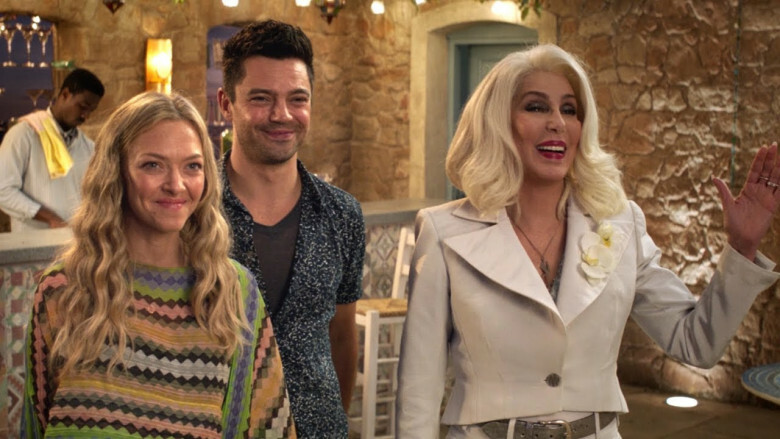 For one: if you have a soft spot for the silver screen Mamma Mia!, don’t expect a whole lot from the original cast. One hall of fame actress, in particular, is in noticeably short supply. And don’t go into this thinking, based on the trailer, that Cher comes in to fill the void. But don’t fret: there is still plenty of Pierce Brosnan. I just can’t understand why they don’t give him numerous musical numbers…at least he mugs, pursed-lipped, to camera at every chance he gets. I joke, because there isn’t a lot to say about the plot of Mamma Mia! Here We Go Again. In fact, I would argue that there isn’t a functional plot point until the final 10 minutes of the film. The majority of the narrative takes place in flashback, where a young Donna (Lily James) graduates from school and decides to travel to Europe. It is here where she experiences romantic entanglements with three different men: the bumbling, virginal Harry (Hugh Skinner); the Swedish, seafaring Bill (Josh Dylan); and the suave, escapist Sam (Jeremy Irvine). This would make for a charming travelogue film, if it weren’t a plot described thoroughly in Mamma Mia!. Mamma Mia! has charm, because the three-possible-dads narrative gives stakes and pathos to the characters’ arcs. That first film may squander these arcs in the final act, but Here We Go Again doesn’t even have arcs to squander. This flashback narrative doesn’t add much to the story. The story of this sequel was developed by original playwright Catherine Johnson, well-know rom-com screenwriter Richard Curtis, and Ol Parker. Parker went on to pen the script proper, as well as direct. Perhaps something was lost in translation from pitch to page; it is hard to say. But there is so little that is new to this flashback narrative to warrant it taking up about over 60% of the runtime. This is sad, because this narrative is much more vibrant than the present day one in which Amanda Seyfried’s Sophie is struggling to set up her hotel opening. This present day plot is, frankly, atrocious. It isn’t a framing device for the flashbacks, in which a lesser plot would come off somewhat forgivable. In terms of a sequel, it is the A-plot. Until the final 10 minutes, though, there isn’t anything to say about this A-plot. There are only tepid obstacles that we know won’t amount to real impediments: tropical thunderstorms, distant boyfriends, Andy Garcia’s perfectly-trimmed salt and pepper beard. At least there are great musical numbers culled from the Abba songbook! They’re just awkwardly staged and don’t hold emotional significance. The bigger numbers later in the film work out fine; they have the choreography and the punchy energy that one would expect. But songs that are meant to fit into the story don’t work. I’m thinking of the scene early on in which Seyfried and love interest Dominic Cooper sing about longing while hundreds of miles away from one another, and while they sing they walk into the view of the same mirror. Or the scene in which a whole chorus chimes along to “Waterloo” while directly addressing the camera. Lily James is a magnetic presence in this film. She is portraying a very different character than Streep, but you can see the vibrant energy of James in the eyes of Streep in the first film. James’ performance almost makes up for the lack of Streep, until Streep shows up late in the film to show us how easily she can elevate a film. James’ counterparts show a mileage-may-vary spread. Skinner is a standout, his fumbling charm making for some effective humor. The other two don’t shine, and Irvine displays a pungent lack of chemistry with James. The younger stand-ins for Christine Baranski and Julie Waters fare much better. Beyond the occasional fun acting performance, though, Mamma Mia! Here We Go Again is a lacking experience. There is more verve in the final musical number than there is in the rest of the movie. Perhaps this is because, at that point, you’re no longer searching between the songs for something resembling a useful plot. The majority of it is retelling the backstory of the previous film. The remainder is party planning. Thanks for sharing a nice reading.